With summer rapidly drawing to a close and AW18 upon us, here are the absolute must-have designer tracksuits for the end of 2018. As you know, the tracksuit is one of the most versatile and popular modern outfits, and it’s not going out of fashion anytime soon. A tracksuit can be sporty or dressed up, classic or colourful, warm and wintery or light and summery. You can wear the complete set, or mix and match the tops and bottoms with other items for countless unique outfits to match any occasion. All in all, the tracksuit is a must-have for the coming autumn and winter of 2018 (and really – at all times). Make sure you feel comfortable and look fly for the rest of 2018. 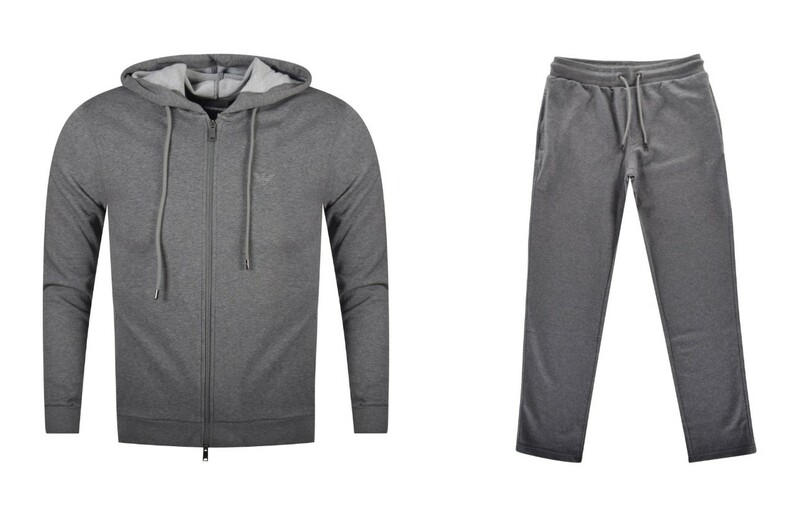 Here are some of our hottest designer tracksuit picks for this season. Founded in the 1980s by Giorgio Armani, Emporio Armani is the more trendy and youthful but equally high-end offshoot of the globally recognised Italian brand. Some high-profile names that have been the faces of the brand include David and Victoria Beckham, Cristiano Ronaldo, Megan Fox, and Rihanna. This tracksuit is a new addition from Emporio Armani’s AW18 collection. It is perfect for lovers of classic design and comfort, crafted from the softest cotton and polyester blend and subtly embossed with Emporio Armani’s signature eagle logo. The hoodie features a full double zip closure, zip pockets, drawstring hood, and ribbed cuffs and hem. The tracksuit pants feature side pockets, a drawstring waist, and open leg hems. This tracksuit also comes in black and blue. Shop the grey and black Emporio Armani logo zip hoodie, £140 each. Shop the grey, black, and blue Emporio Armani logo track pants, £120 each. Gianni Versace has been one of the top names in the fashion industry since the 80s and 90s. Having learned the trade from his mother’s dressmaking business, Versace went on to design for many infamous names including Madonna, Princess Diana, Elton John, and Tina Turner. He is known for having brought the fashion and music industries closer together through his creations and collaboration with stars. The Versace Jeans line focuses on casual wear while incorporating elements of the Gianni Versace line. An eye-catching new AW18 design from Versace Jeans, this black tracksuit features a high-contrast badge logo on both the top and bottom piece. On the crew-neck sweatshirt, the felt embroidered logo features on the chest. On the cuffed jogging bottoms, the front right pocket displays a written logo while the back pocket on the reverse features the logo badge. The tracksuit is made with ultra-soft cotton. It will go perfectly with your favourite black or white trainers. Just wait until you see the heads turn as you walk by. Shop the crew-neck sweatshirt, £150. Shop the jogging bottoms, £135. Marcelo Burlon is an intriguing personality who travels the world as a famous party organizer, DJ, creative director, photographer, nightlife wizard, and more. His clothing line is known as County of Milan. While he brings people together with his endless creativity and contemporary genius, he doesn’t like to be labelled a designer, preferring to describe himself as an art director and a hippie. Kappa, on the other hand, is a world-famous Italian sportswear brand that was born out of a sock and underwear company in Turin, Italy in 1916. It didn’t become Kappa until 1967, and now the signature “omini” logo, which features a man and woman sitting back to back, is impossible not to recognise. Funnily enough, the logo was created by accident after a swimwear photoshoot. Many unique items were created thanks to the exciting recent collaboration between Marcelo Burlon and Kappa. One of these is this fantastic black and multicolour polyester tracksuit. Both the collared jacket and the track pants feature signature kappa tape along the sides in bright multicolour. The jacket also features high-contrast logos on the front left of the chest and across the back, while the track pants feature a logo on the left front pocket. The items both have convenient zip side pockets. To complete the look, there is even a matching cotton t-shirt with multicoloured signature kappa tape running from the collar down both shoulders and sleeves and a logo on the chest. Get in on this special collab creation before it sells out. Shop the jacket, £349, the pants, £279, and the matching t-shirt, £185. Canadian identical twins Dean and Dan Caten (born Catenacci) launched the DSQUARED2 brand in 1995. In the early 90’s, they worked for Gianni Versace and Diesel, and the latter helped them fund and launch their own brand. Known for their extravagant runway shows, they have worked with famous personalities like Madonna, Rihanna, and Bill Kaulitz. They also designed the official uniforms for football team Juventus in 2006, and co-hoted their own TV show called Launch My Line. These boldly printed pieces feature in DSQUARED2’s latest Icon Collection. Made with 100% cotton and printed with the unmissable ICON logo, this tracksuit is a style-meets-comfort must-have this season. Both items also feature small DSQUARED2 logos, namely on the back of the neck and on the back pocket. The crew-neck has ribbed cuffs and hem, and the joggers have cuffed pant legs. Both items come in various colour styles, so start looking for your favourite. Shop the sweatshirt in navy and white and black and gold, £249 each, and the jogging bottoms in black, £249. Founded in 1983 by Franco Moschino, Moschino is a globally recognised luxury fashion house specialising in leather accessories, shoes, luggage, and fragrances. The label became famous for its innovative, colourful, and occasionally eccentric designs, while the man behind it became known for his love of fairies, criticism of the fashion industry, and social awareness campaigns in the 90s. Although Moschino sadly passed away in 1994, the brand lives on strong, and continues to design for famous personalities including Madonna, Kylie Minogue, and Lady Gaga. This bold and classy tracksuit is new from the latest AW 2018 Moschino collection. Made of 100% soft cotton, it is super wearable for any occasion, whether you put on the full tracksuit or match the hoodie with some jeans, for example. The black pullover hooded jumper features large contrasting white branding across the chest. 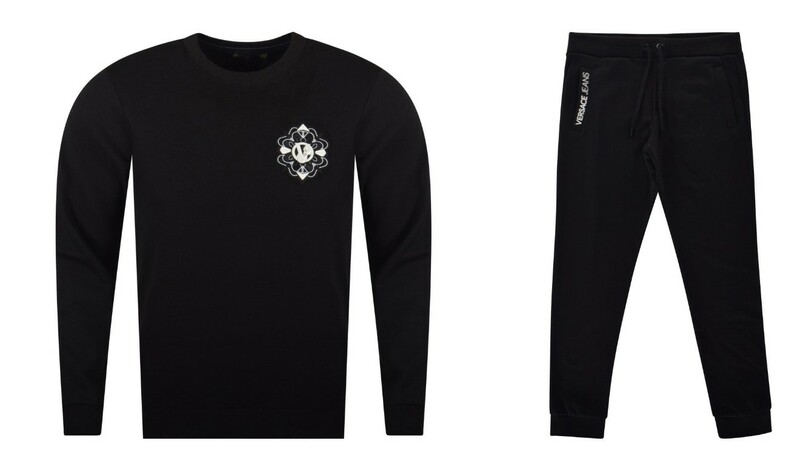 The cuffed jogging bottoms feature the same logo and branding on the front left pocket to match. 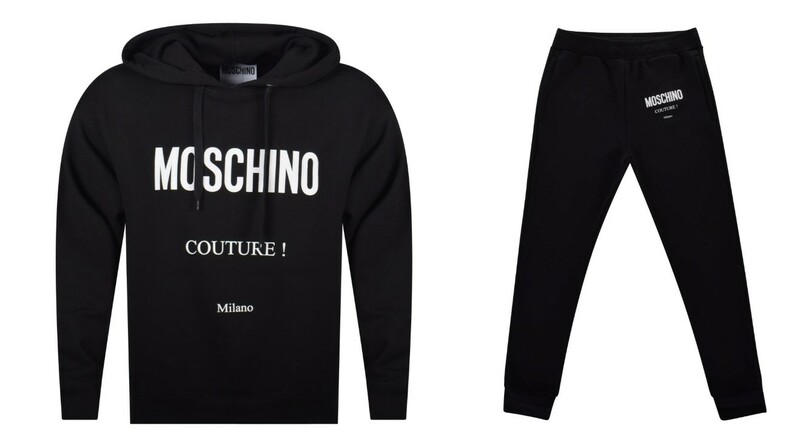 This Moschino tracksuit is ideal for wear with your favourite pair of black or white trainers. Get it now to stay warm, comfortable, and fly this autumn. Shop the hoodie, £280, and the matching jogging bottoms, £235. True Religion is a California brand established by Jeff Lubell and Kym Gold in Los Angeles in late 2002. The brand started with focus on revolutionary high-end denim, but has since expanded to include sportswear and other casual clothing. They claim that their signature horseshoe logo was inspired by the silhouette of a Buddha’s smile. This tracksuit is an all-round treat from True Religion. Made of a 50/50 cotton and polyester blend, it is breathable and perfect for warmer autumn days. The body of the tracksuit is a classic navy blue, but the red and white stripes on the sleeves and legs really make it pop. Add to that the TR signature horseshoe badge and you have a truly eye-catching #ootd. Both pieces have zip pockets and drawstrings for comfort and convenience. Don’t miss out on this look this season. Shop the hooded zip jacket, £169, and matching sweatpants, $129. American fashion designer Ralph Lauren began his own fashion line in 1967, when he was just 28 years old, by convincing his boss at a tie manufacturer to let him begin his own line of ties. One year later he started a complete line of menswear, allegedly working out of a single drawer in a showroom in the Empire State Building. He named it Polo due to his interest in sport, and made deliveries to stores by himself. By 1969 he had his own boutique at Bloomingdale’s department store. In 1972, the legendary polo shirt with the iconic logo first appeared. Fast forward to now, and Polo Ralph Lauren has become one of the most popular fashion brands in the world. 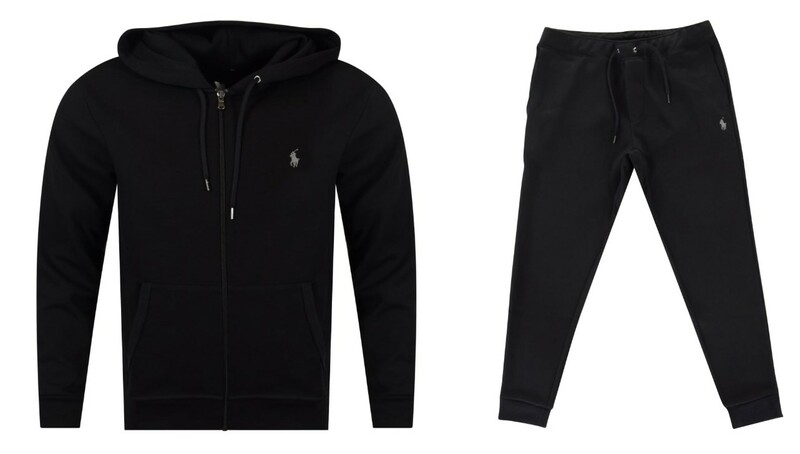 If you are a lover of classic design that speaks for itself combined with extreme comfort, then the Polo Ralph Lauren Performance zip hoodie with matching cuffed jogging bottoms is the tracksuit for you. The sleek and casual slim-fitting hoodie features a full zip and functional drawstring hood, while the classic jogging bottoms feature open side pockets, cuffed ankles, and a drawstring waist. 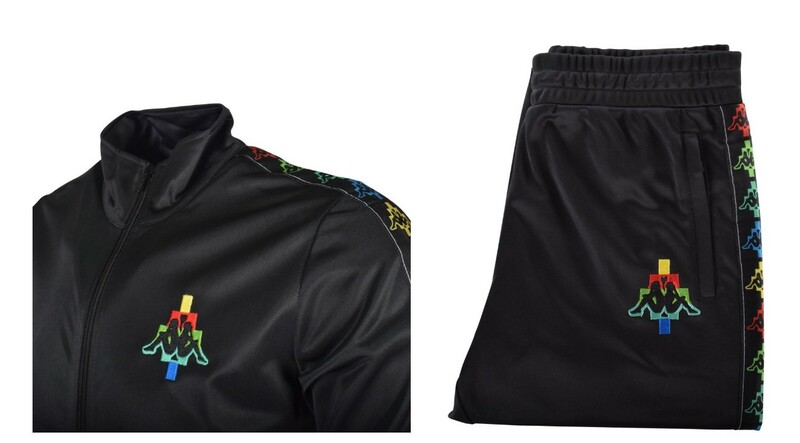 The tracksuit is made of 58% polyester and 42% cotton for durable breathability and comfort. This outfit is available in black and navy. Shop the black and navy hoodie, £119 each, and the black and navy jogging bottoms, £89 each. Hugo Boss started his own clothing company in Metzingen, Germany in 1923. He later worked closely with the Nazi party, designing uniforms before and throughout the war. He died in 1948, but the high-end fashion company lives on in four different lines, including Boss, Boss Orange, Boss Green, and Hugo. Of these, Boss is the line best known for classic designs. No one does casual like Boss by Hugo Boss. Crafted from the softest of cotton, once you feel this staple outfit, you won’t be able to resist. The design is exceptionally sleek, with subtle but eye-catching square badge logos on both the zip hoodie and the sweatpants. The hoodie has open side pockets, a full zip closure, and a drawstring hood. The sweatpants feature two side pockets, drawstring waist, and gathered ankles for a slim look. 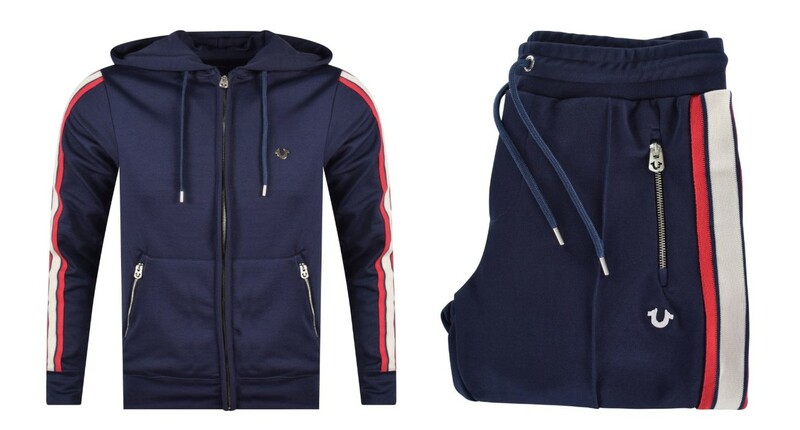 Altogether, this tracksuit is the perfect casual outfit for the coming autumn. 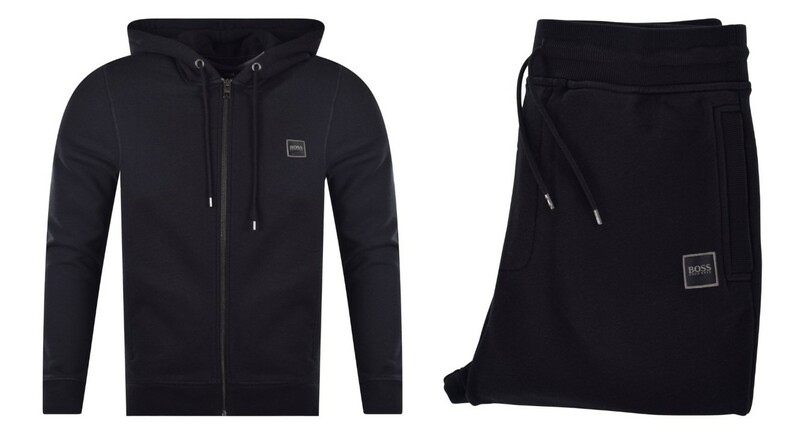 Shop the hoodie in black and grey, £149 each, and the sweatpants in black and grey to match, £119 each.